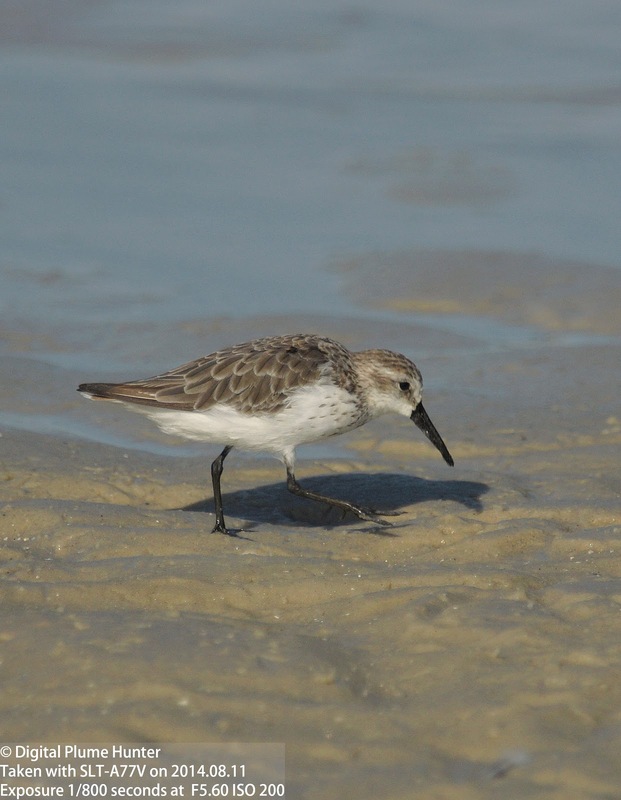 Shorebird identification presents many challenges to both the initiated and the uninitiated -- Short-billed vs. Long-billed Dowitcher; Black-bellied Plover vs. Golden Plover; Baird's Sandpiper vs. White-rumped Sandpiper; Semipalmated vs. Western Sandpiper; to name but a few identification conundrums. 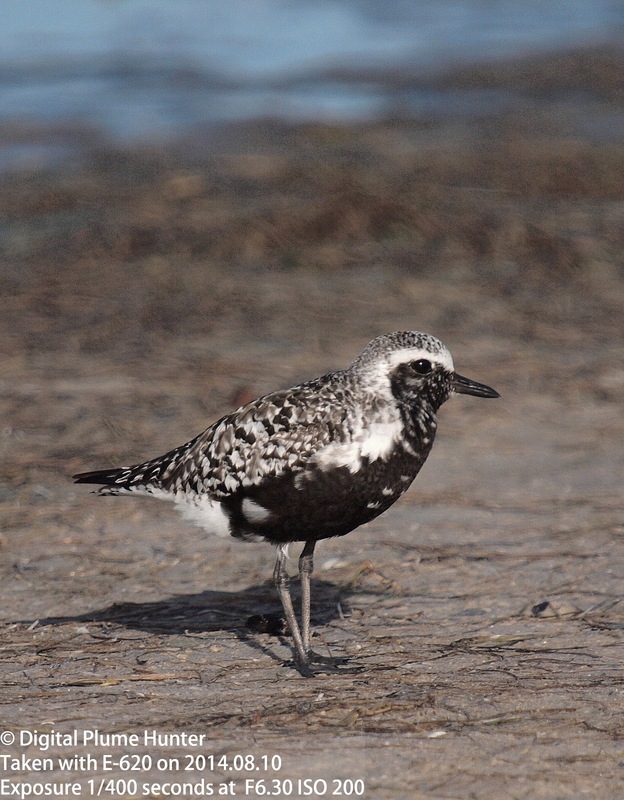 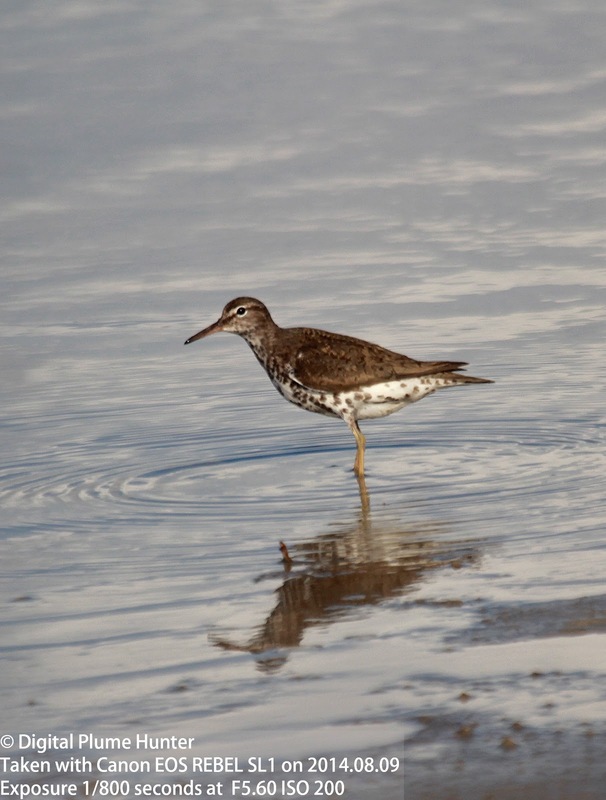 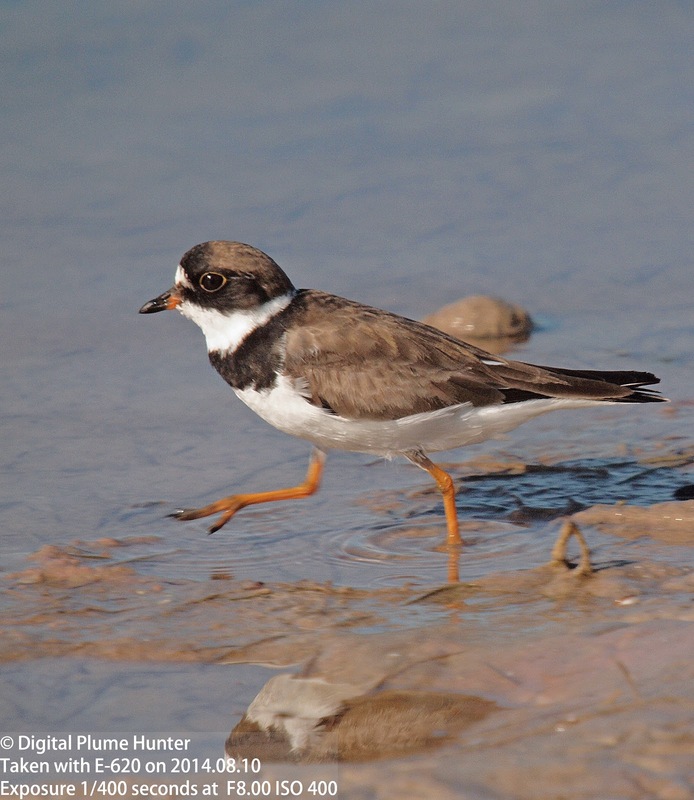 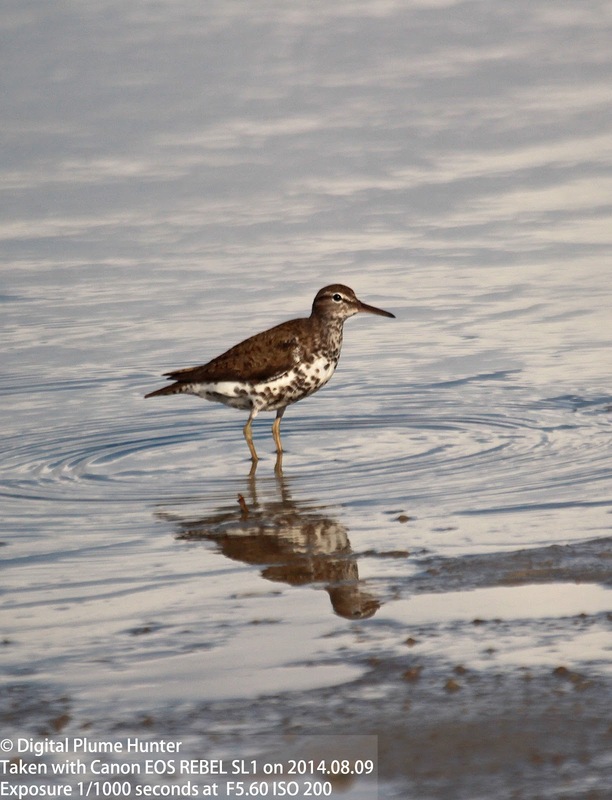 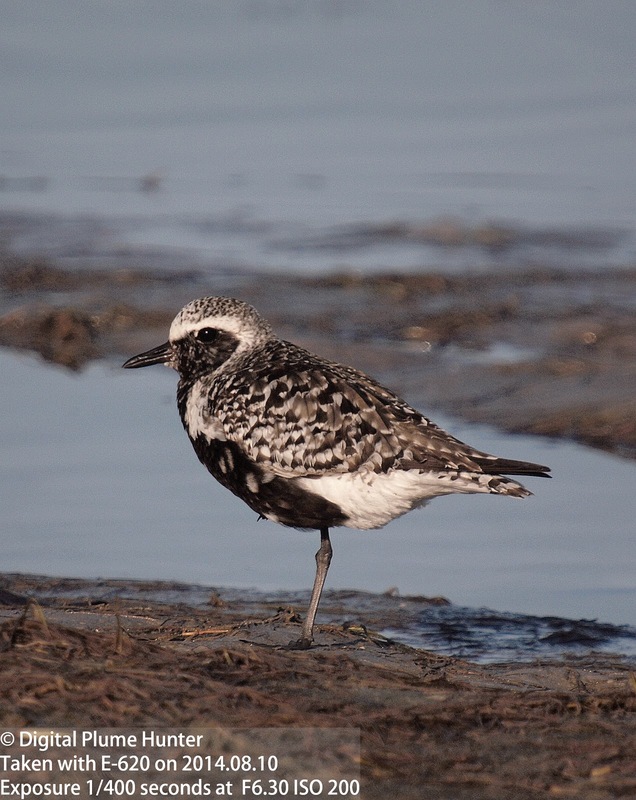 However, should inter-species identification be insufficiently daunting, the courageous birder is encouraged to test their skills at disambiguating shorebird subspecies. 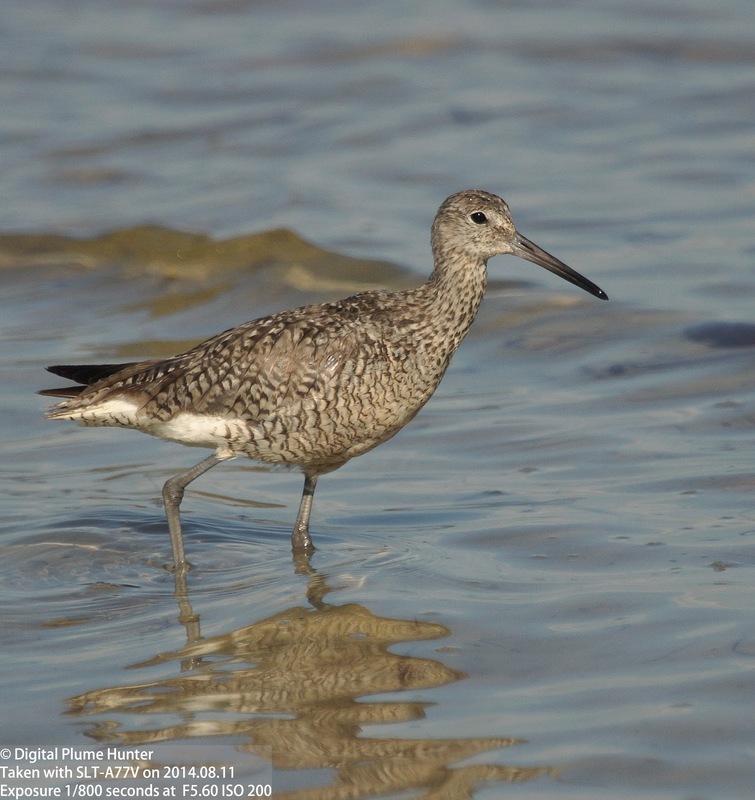 And, a great example of this genre is the one that involves distinguishing between Western Willet and Eastern Willet (both sufficiently different that their future candidacy for full-species status is deemed likely and perhaps even inevitable; see Sibley's Article). 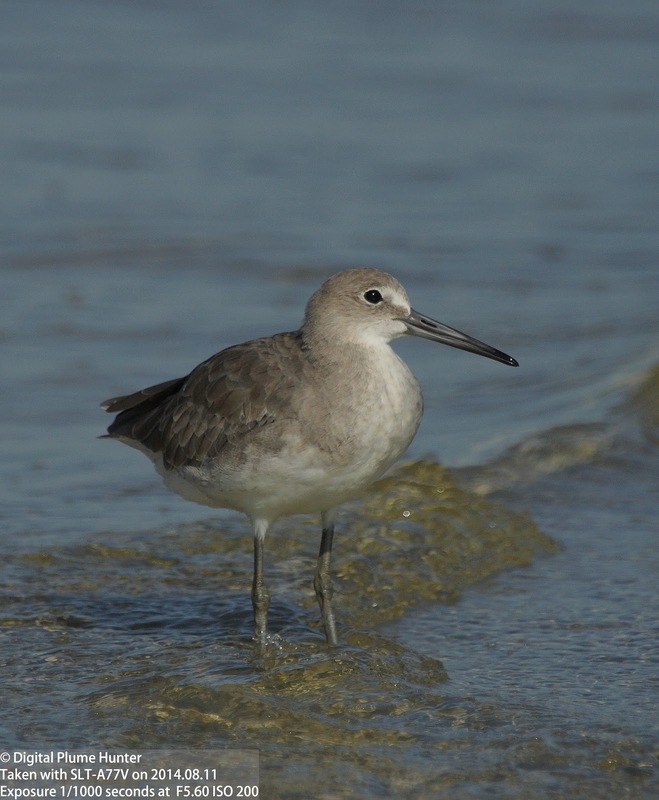 Both Eastern and Western Willets are observed in SW Florida -- the former only in passage (this blogger has seen them in Fall migration from early July through early August although I have not recorded the dates of their passage in Spring) and the latter as a Fall and Winter visitor. 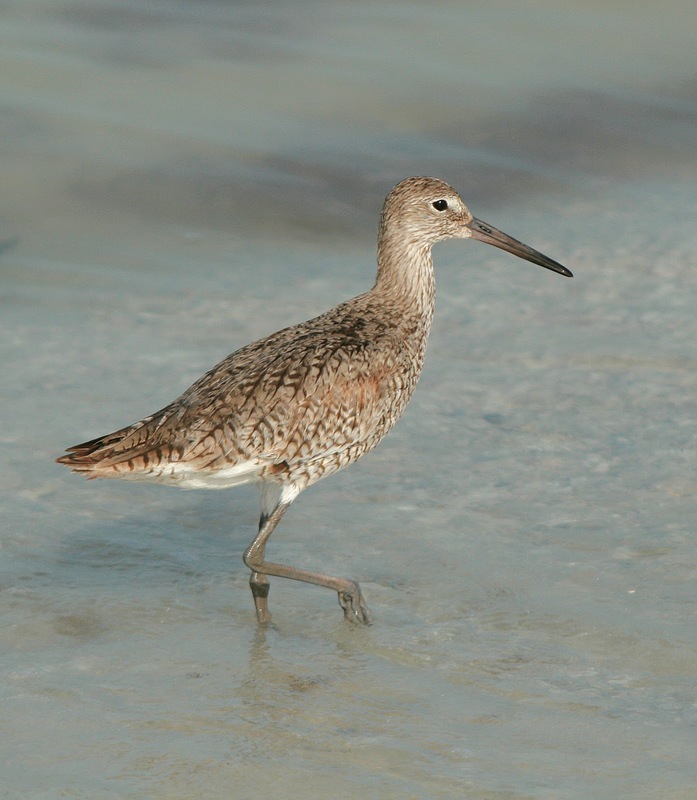 Looking at the Eastern Willet (in alternate plumage) above, two things stand out: the extensive marking and barring on the back, breast and flanks and the overall brown coloration. 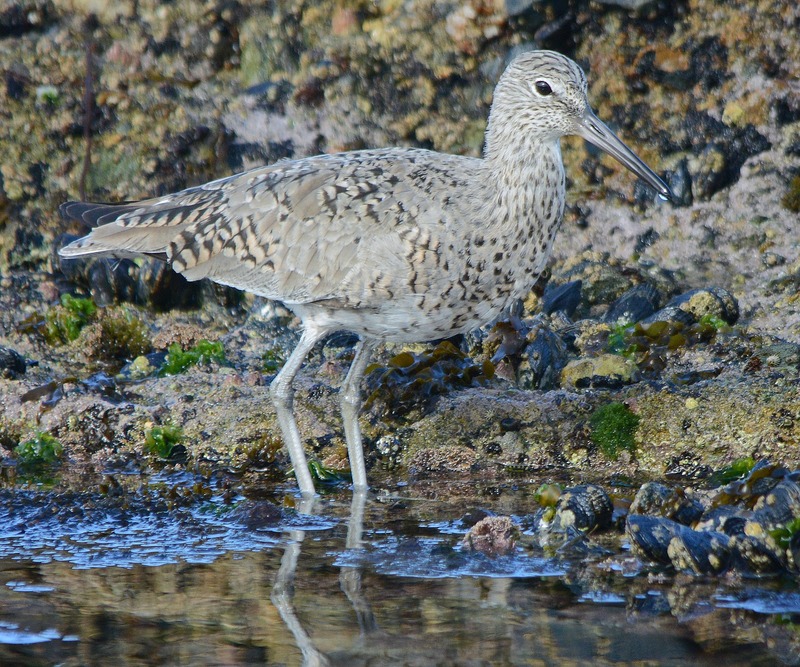 In contrast, the Western Willet appears decidedly grey rather than earthy brown and the markings are less extensive (especially on the back and flanks). 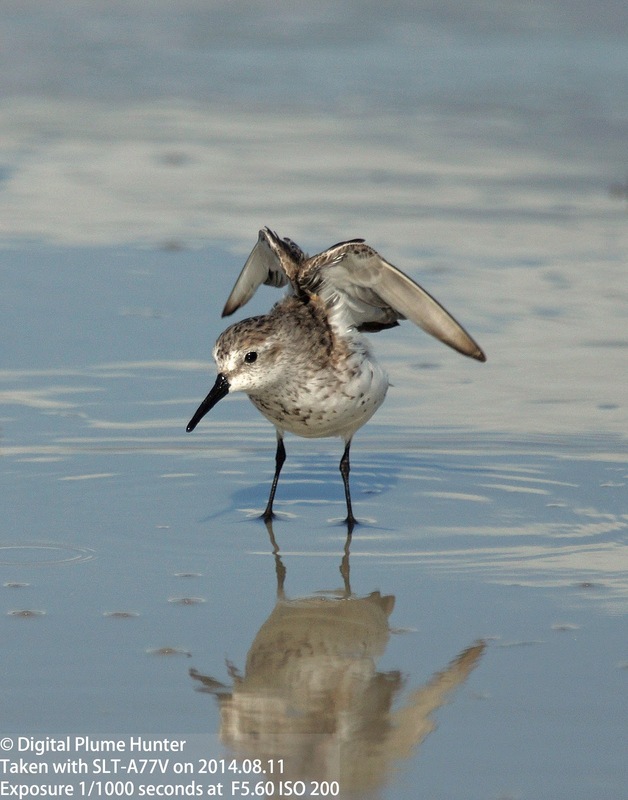 Of course, when the birds are not in alternate plumage, these clues are insufficient and other diagnostic features must be employed. 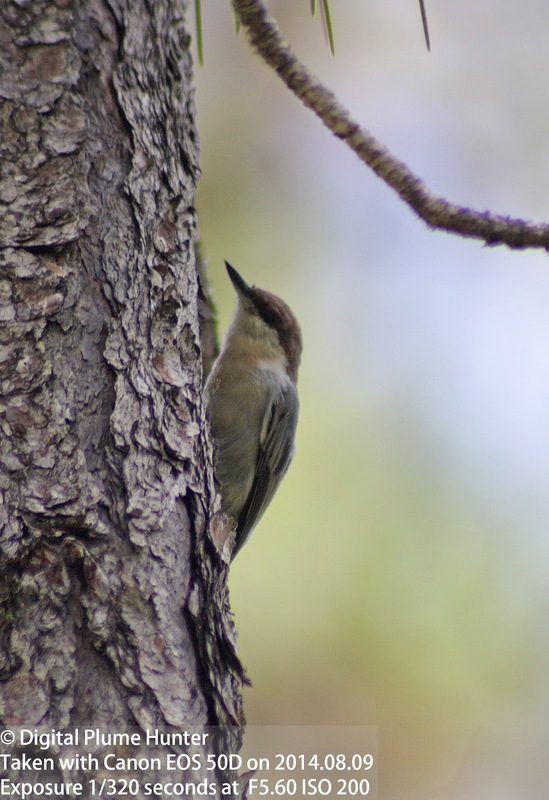 And, these additional features are: the bill (Eastern's is stouter and more compact; Western is longer and tapers to a thin point); the shape of the crown (Eastern's is flatter compared to Western which is rounder); and body structure (Eastern's is slimmer and shorter necked). 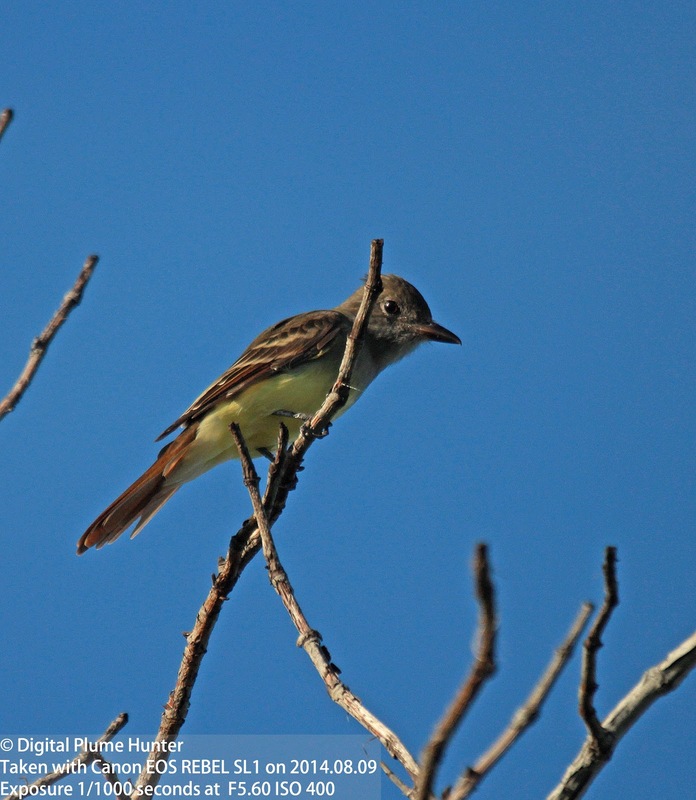 And so now the question: which subspecies is it? 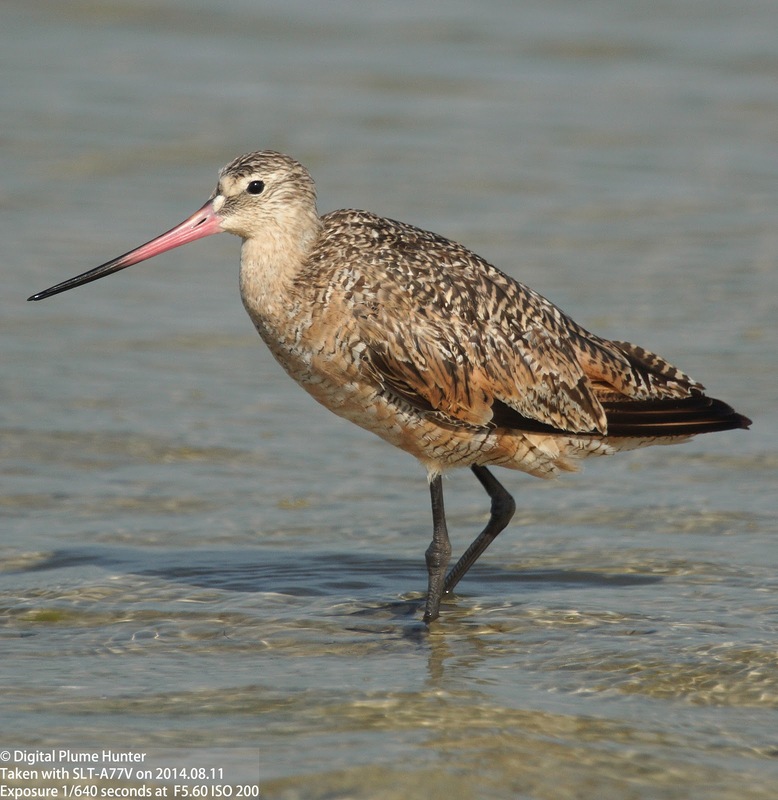 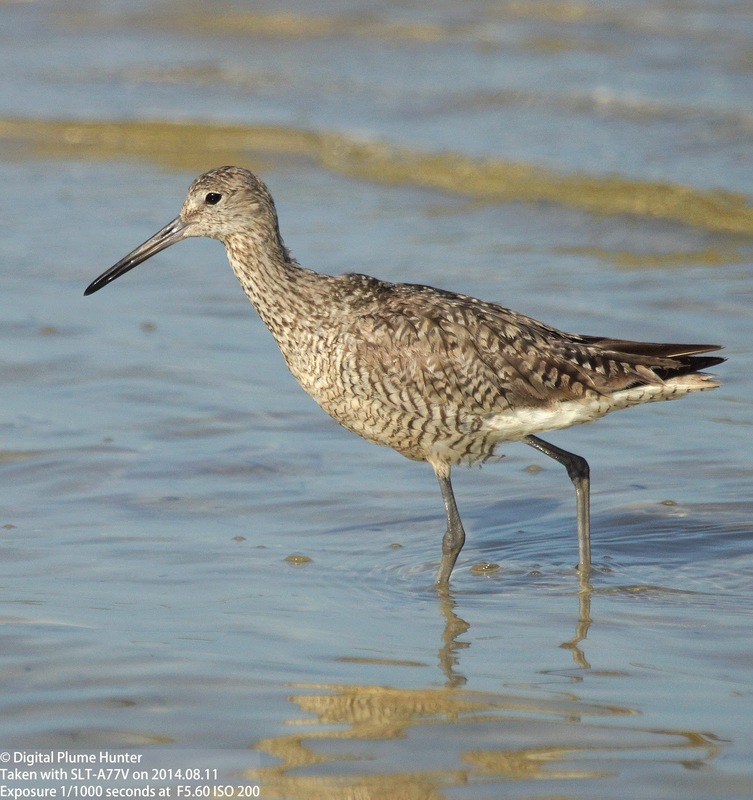 More on the differences between the two Willet subspecies may be found here: Aba Article on Willet Subspecies. 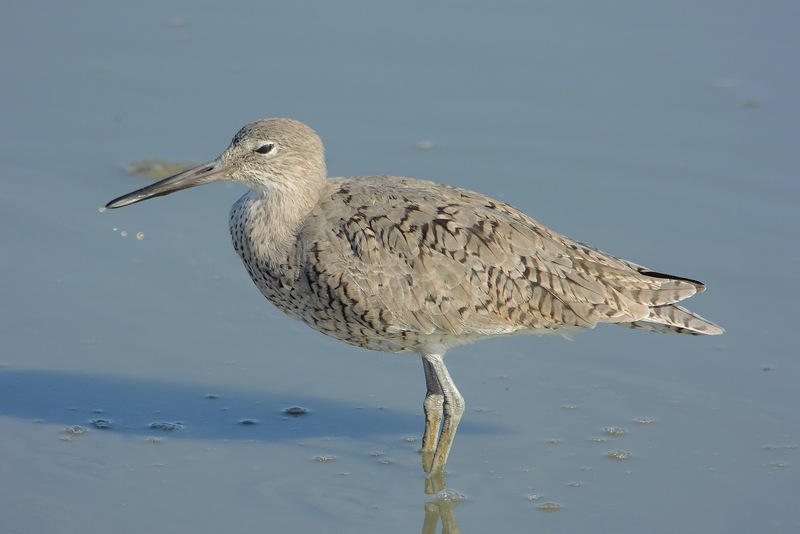 Lastly -- this Willet in basic plumage also provides a good example -- the bill tapers to a fine point, the crown is nicely rounded -- and therefore, this fits the characteristics expected of the Western subspecies. 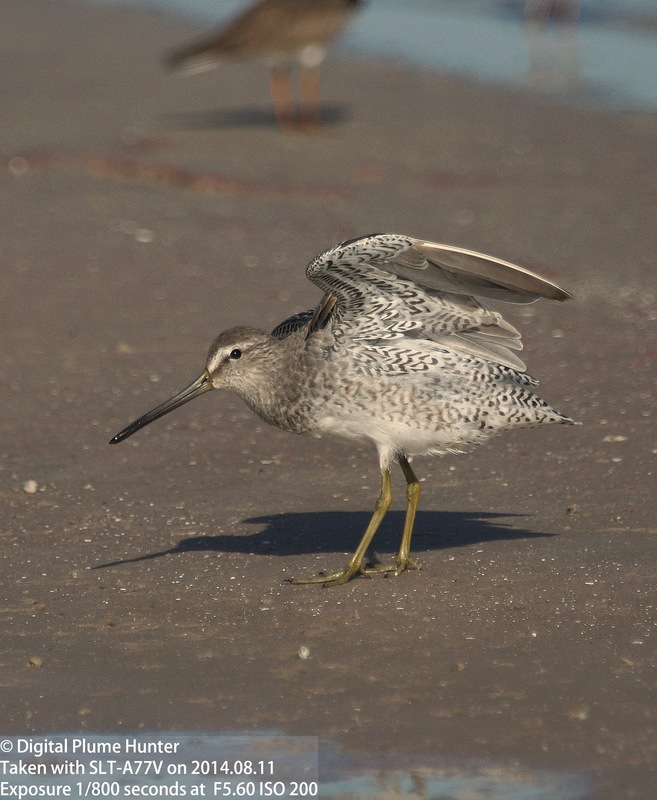 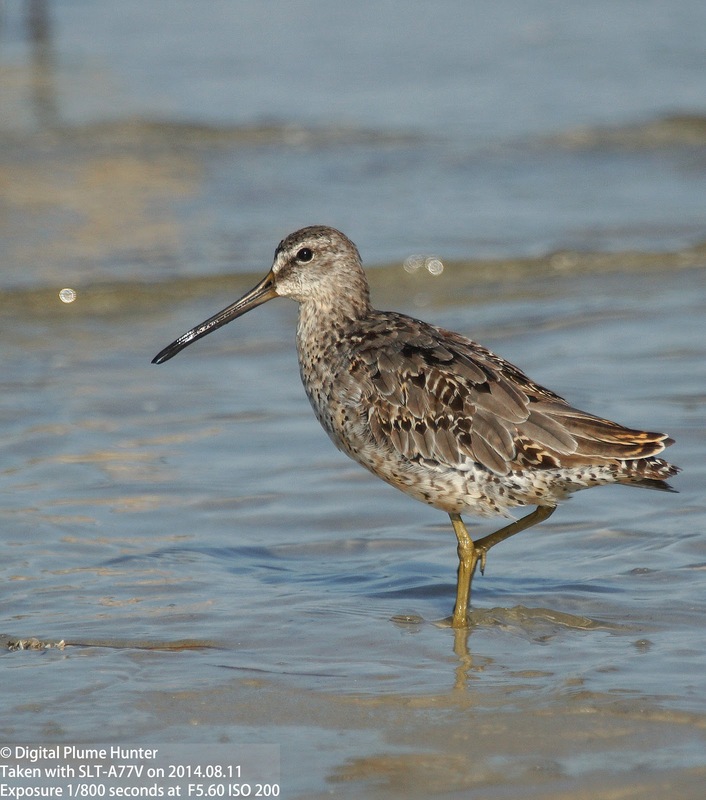 Mercifully, Long-billed Dowitchers favor freshwater and are not observed coastally making every Dowitcher observed at Bunche Beach, by default, a Short-billed. 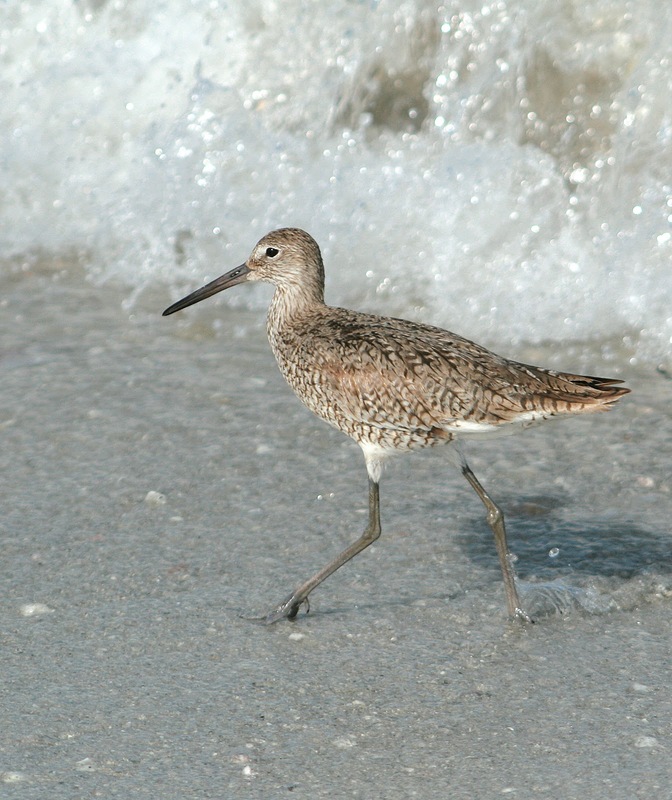 Willets abound on our beaches and while they are generally overlooked because of their abundance, a closer look at the right time of year can tell which are the 35% of the total population that are classified as Eastern Willets and are just passing through; and, which are the other subspecies -- the more numerous Western Willets that will overwinter here. 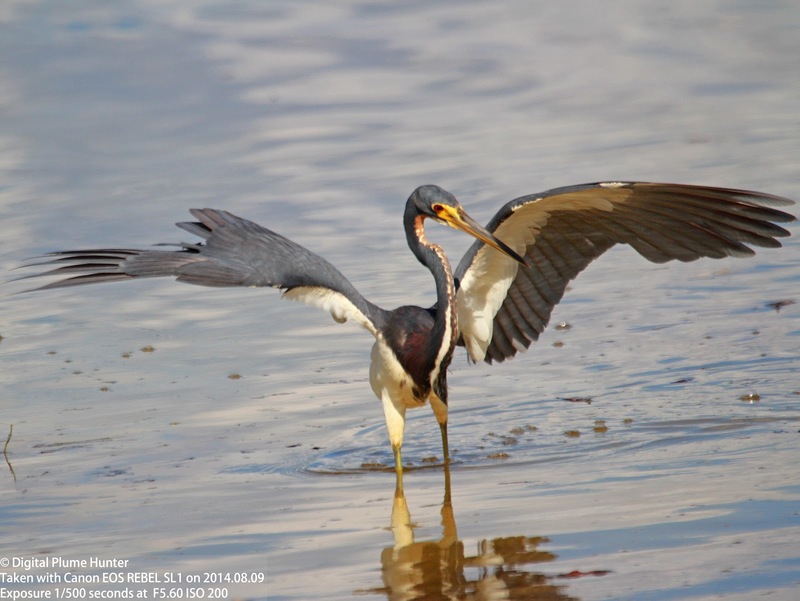 The kink in the heron's neck is a distinctive evolutionary adaptation and is a result of an elongated 6th cervical vertebra. 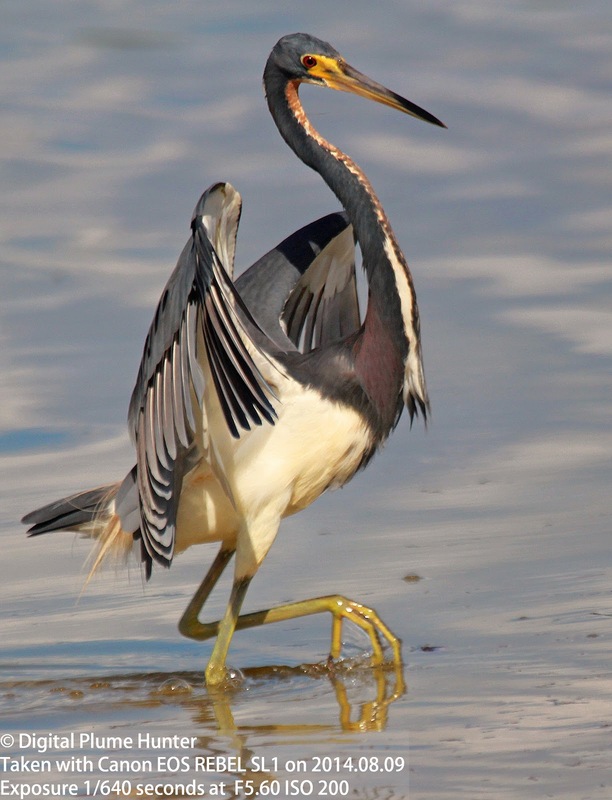 This unique "anatomical hinge" is what gives the heron its powerful fish-catching strike. 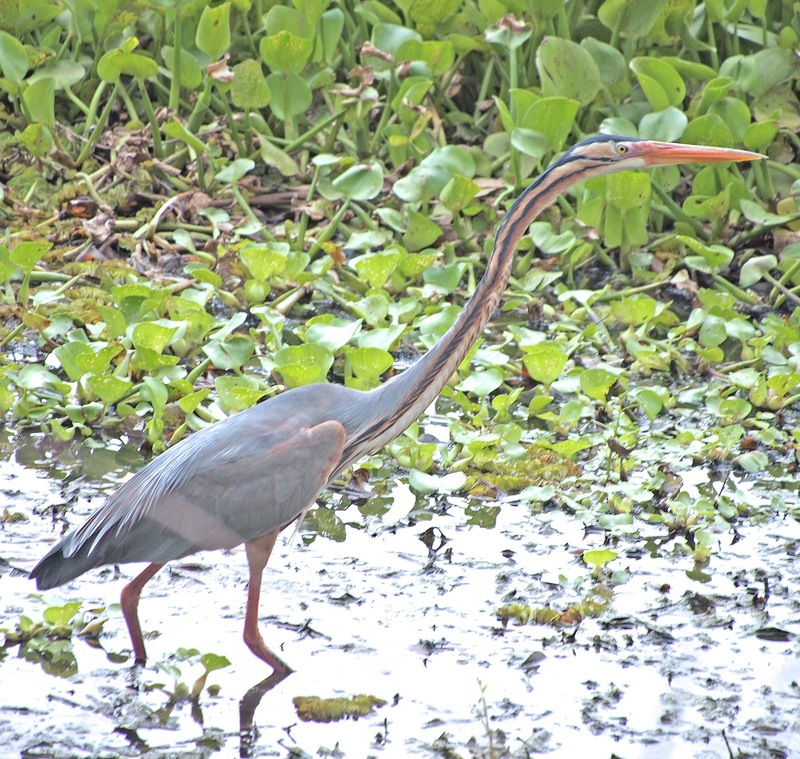 Tricolored Heron seen at Tigertail Beach. 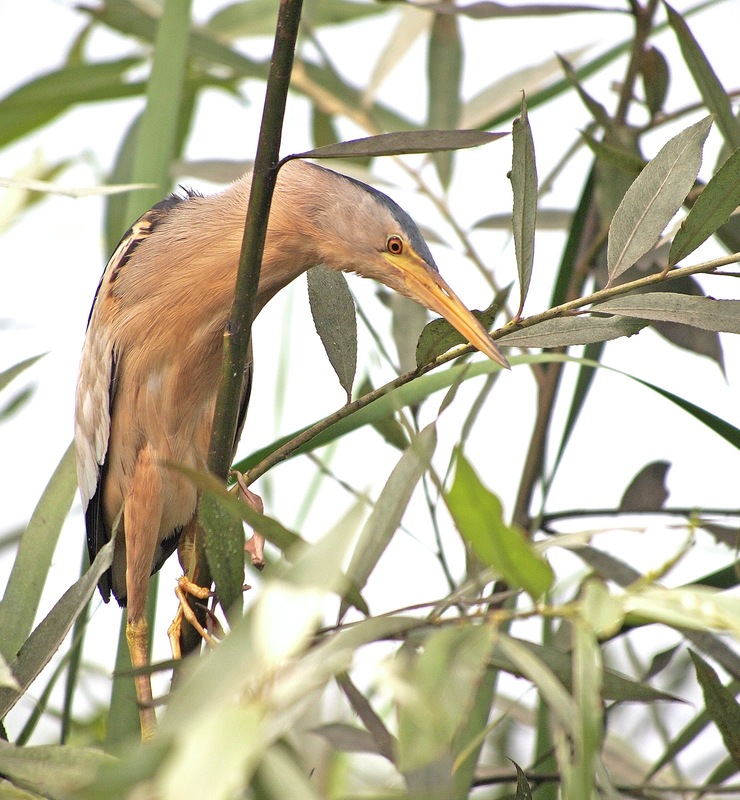 This side view does justice to its long, spear-like bill. 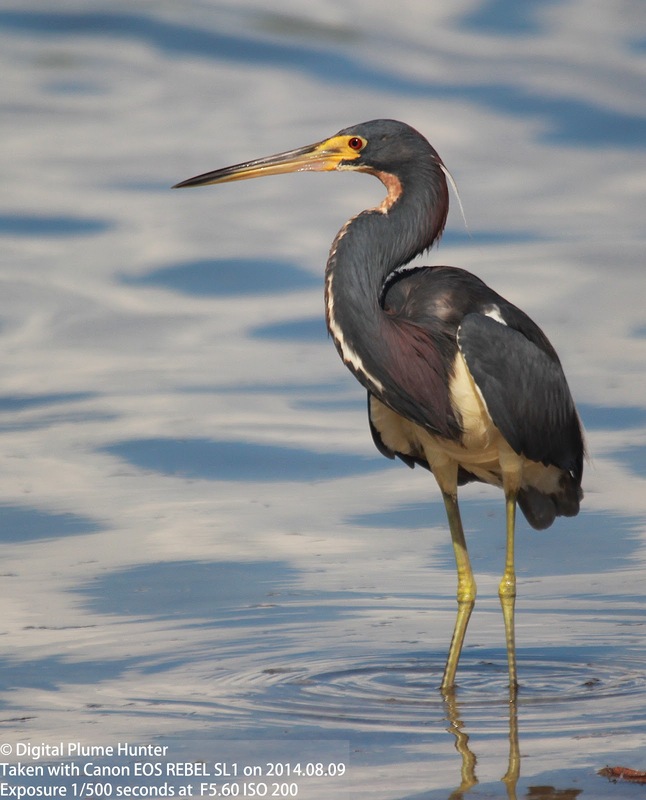 The Tricolored Heron is, in many ways, the archetype heron. 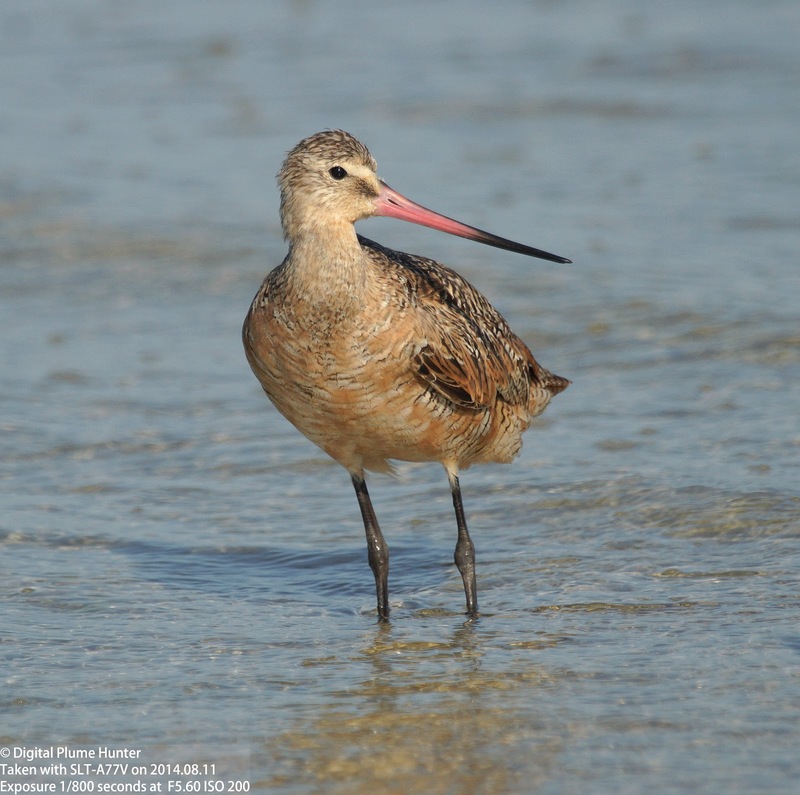 The first thing that stands out is the impressively long, spear-shaped bill. 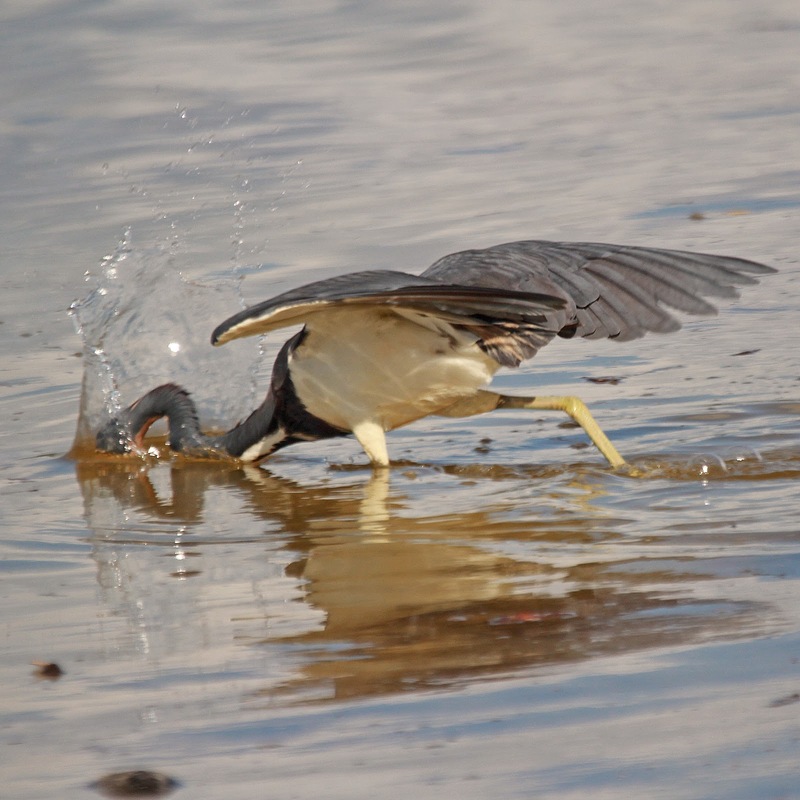 The more aquatic and fish-dependent the heron, the longer and slimmer the bill. 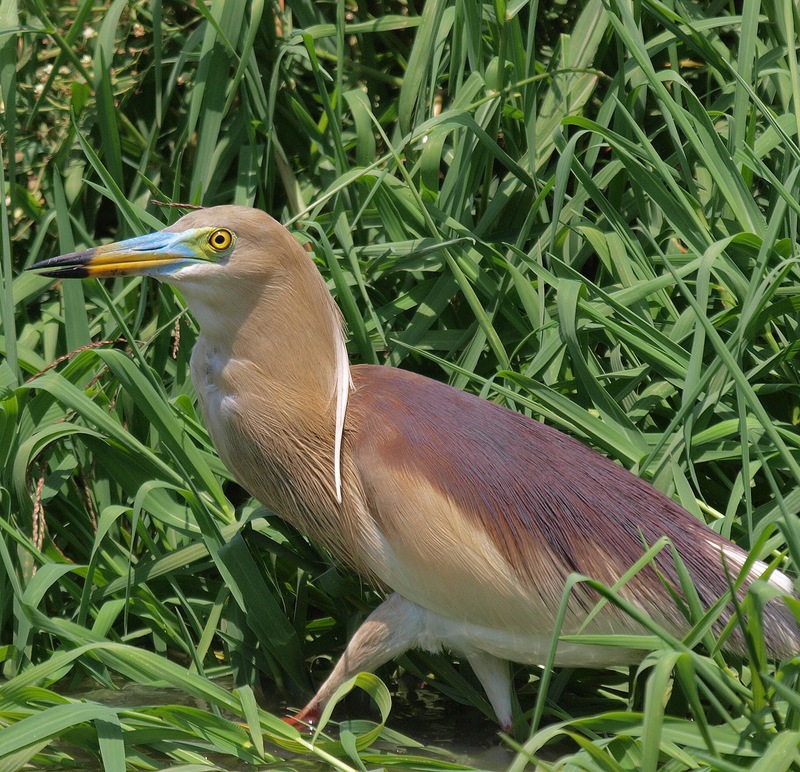 In counter example, the Cattle Egret has a much shorter bill -- which is perfect for an insect eating "ground heron". 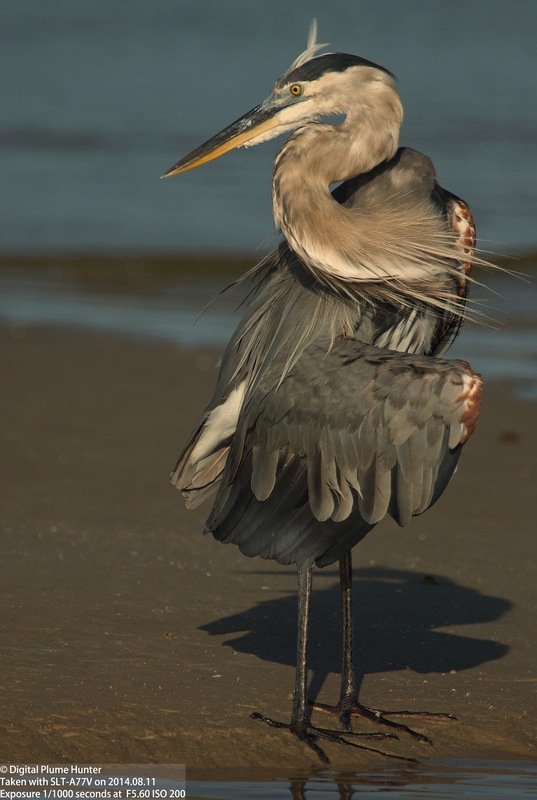 Our next heron, the Great Blue, also fits into the typical heron mold: the flexible, long neck with the prominent kink; the bill here, while proportionally not as long as the Tricolored's, is still long but appreciably stouter -- a feature that helps it catch larger fish. 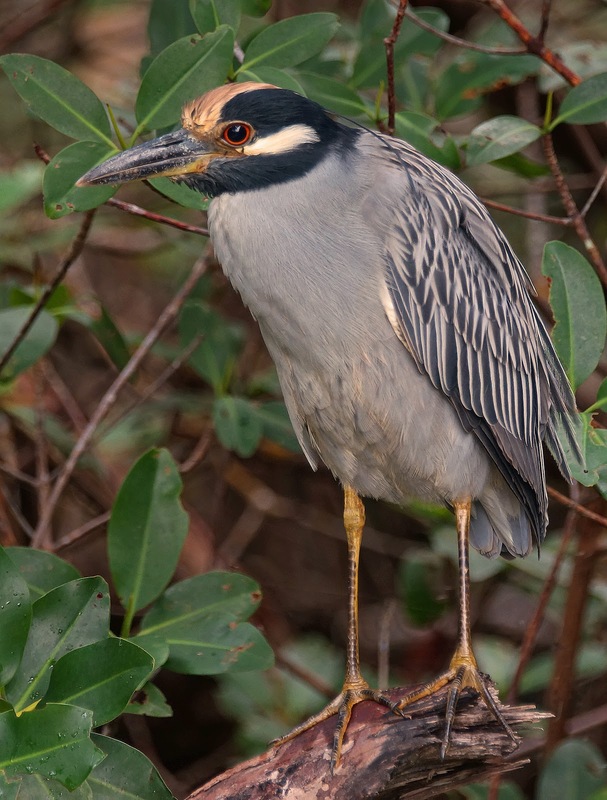 Yellow-crowned Night Heron seen at Ding Darling (Nov 2013). 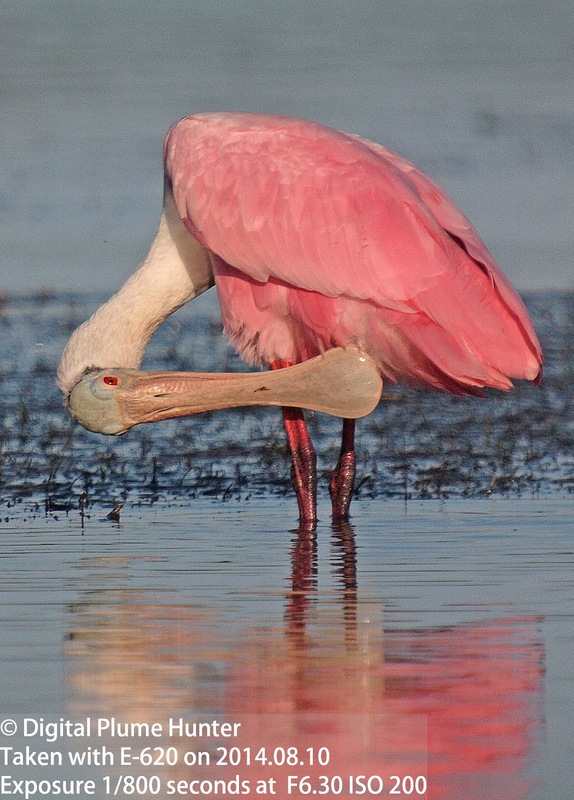 Note the powerful bill. 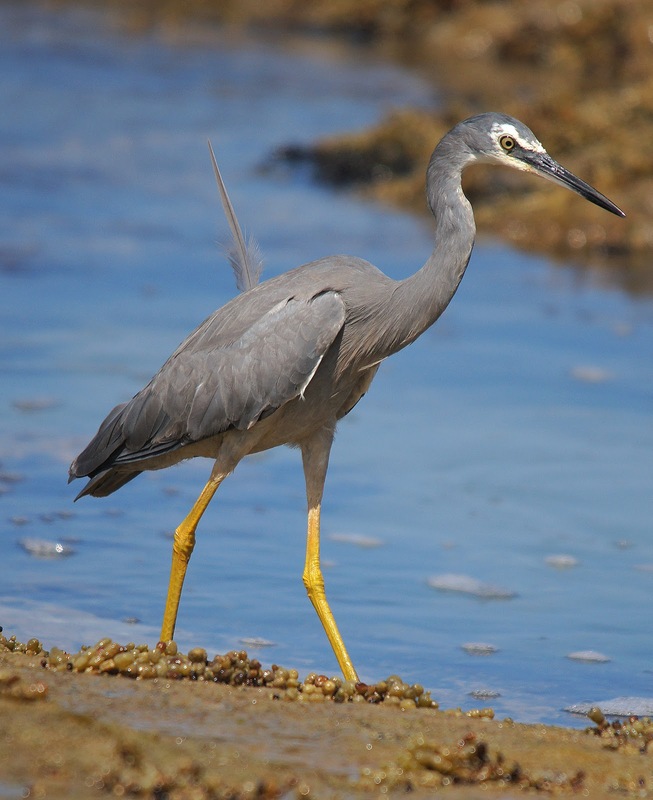 It is the serial crab predator, the Yellow-crowned Night Heron, however, that typifies food-based bill specialization in the herons. 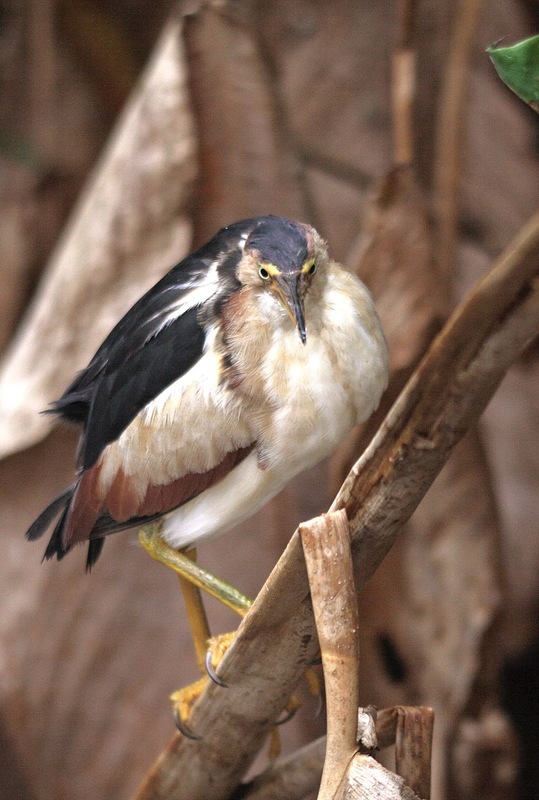 Compared with the Tricolored's, the night heron's bill is much more compact as well as thicker -- a powerful bill that is perfectly suited for preying on crabs and crayfish. 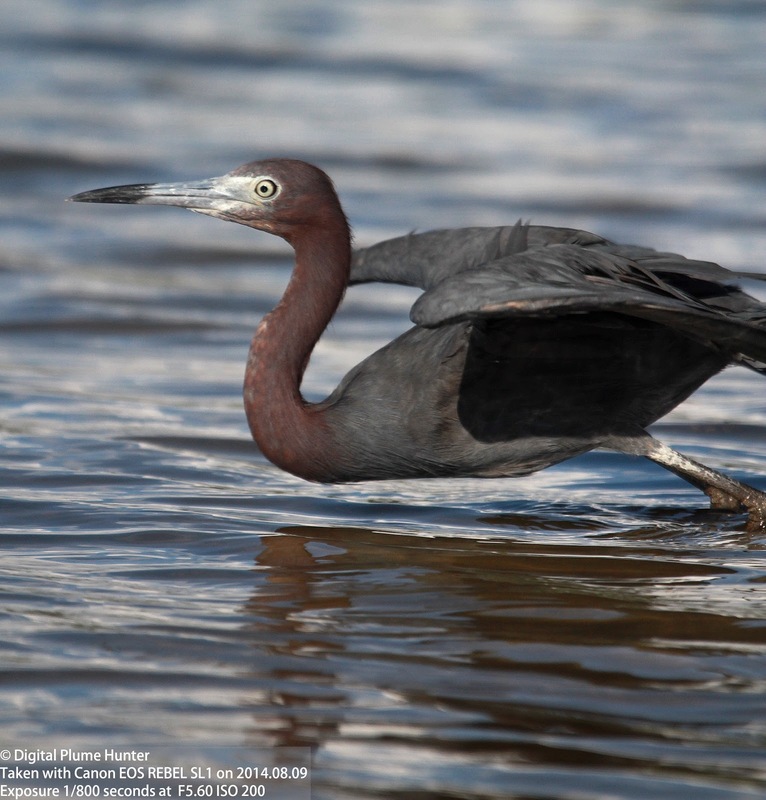 Compared to the Yellow-crowned night Heron, both the Little Blue Heron and the Reddish Egret display the typical characteristics of fish-eating herons -- long necks and slender bills. 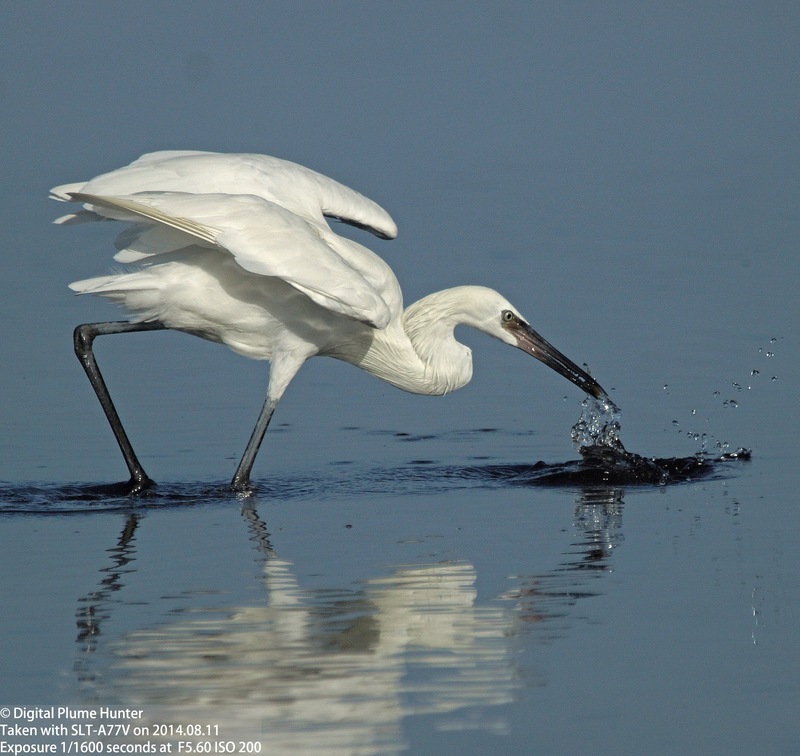 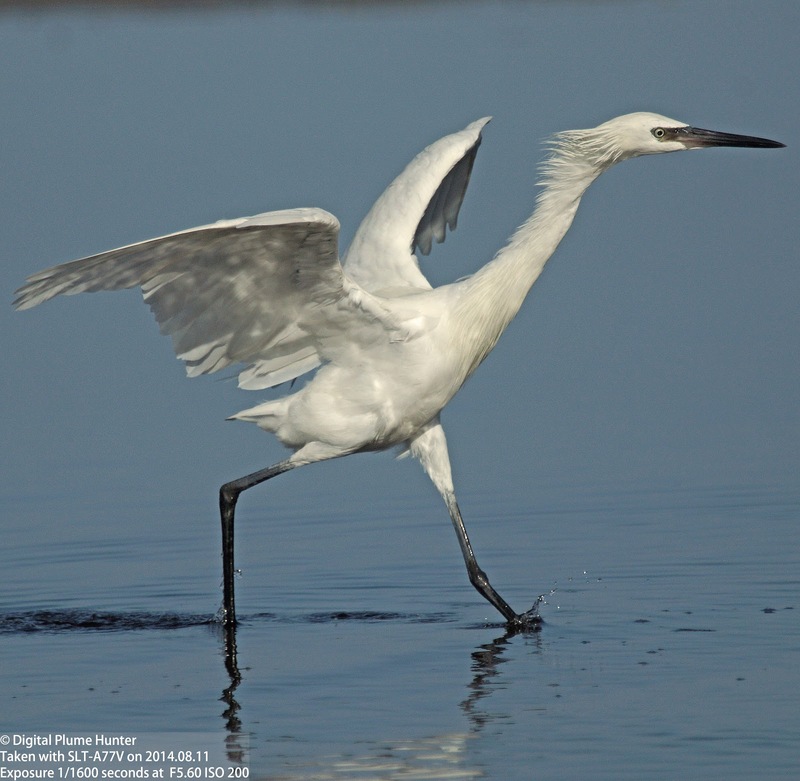 While the basic anatomy of both the Little Blue Heron and the Reddish Egret is similar, their foraging habits are not. 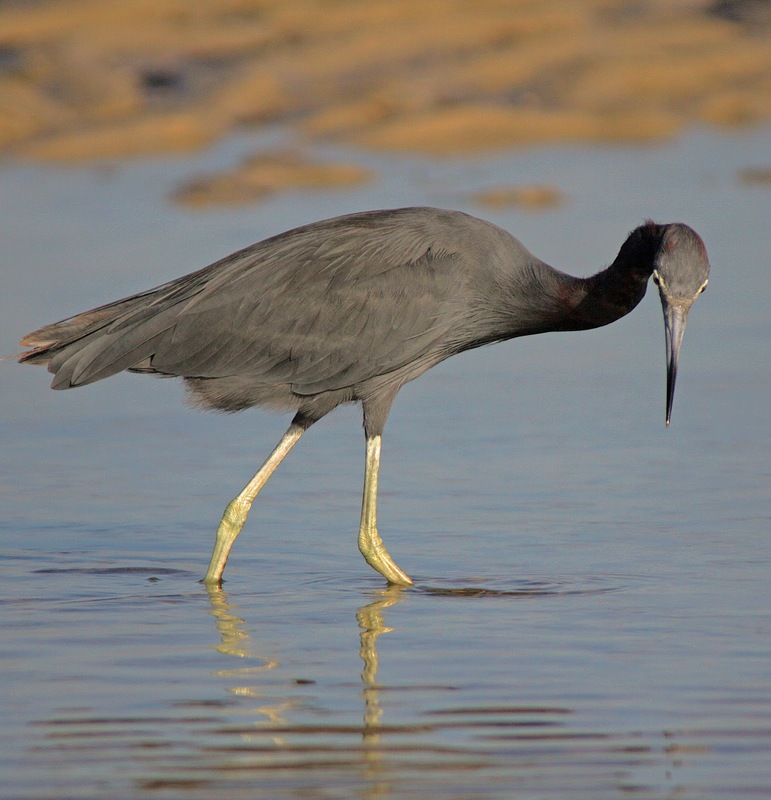 The Little Blue Heron is a slow and deliberate hunter and uses "Head Swinging" (see above) -- its long neck swaying over the water not unlike the movement of a snake. 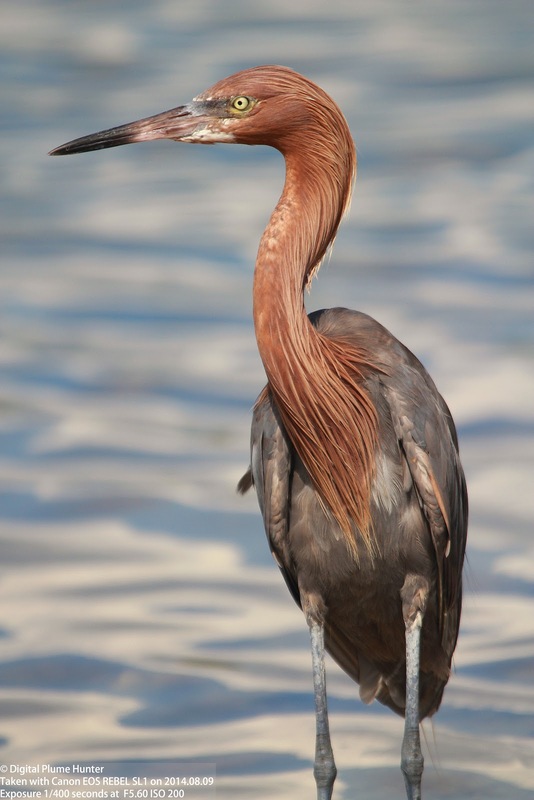 Compare this with the foraging antics of the Tricolored Heron and Reddish Egret. 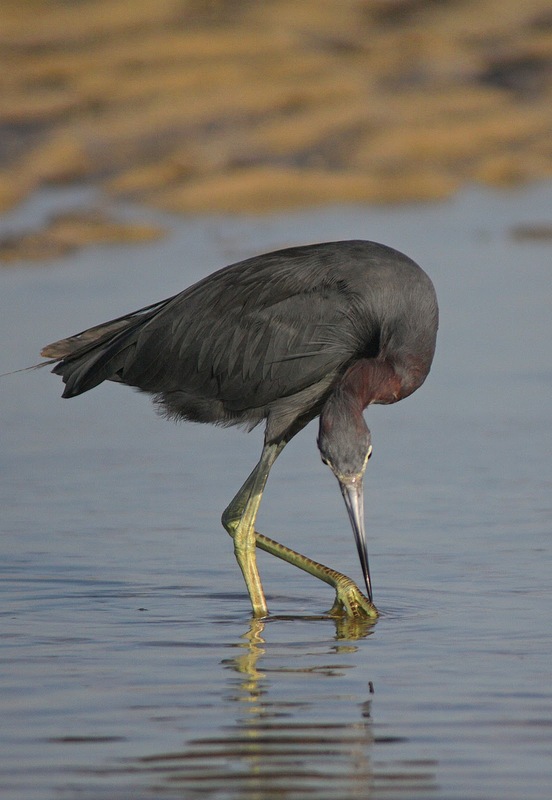 The Tricolored Heron (as the text explains) frequently uses Open Wing Feeding which is preceded by Stalk, Hop, Run and then with Open Wings, Lunge and Strike. 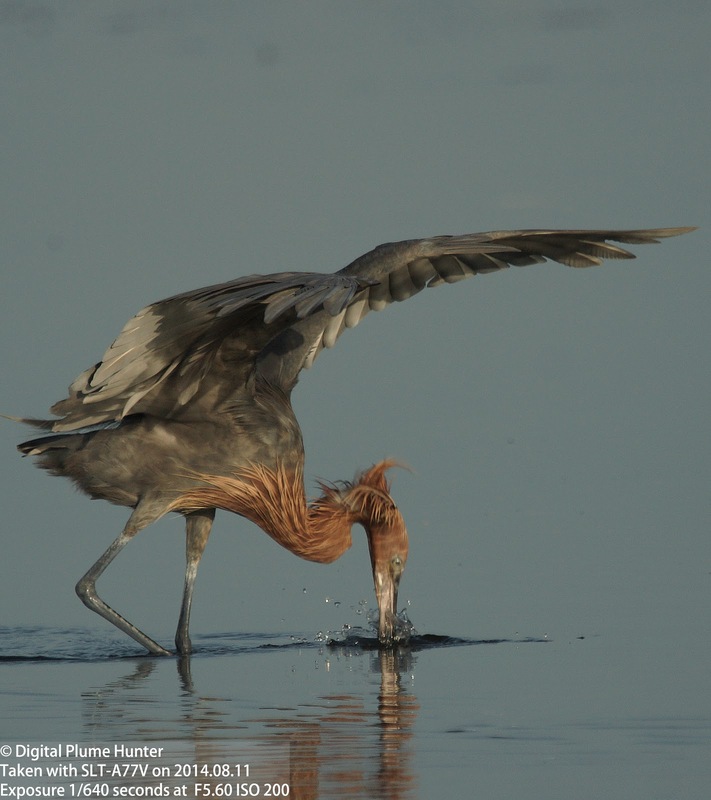 When it comes to foraging, however, no American heron is perhaps as energetically entertaining as the Reddish Egret. 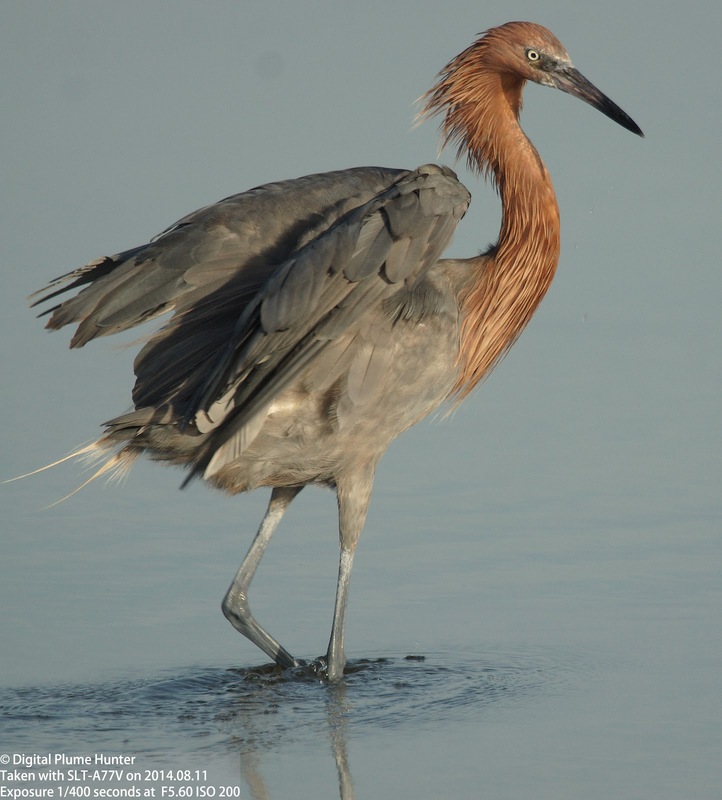 While the stoic hunters like the Great Egret and Great Blue Heron use a lethargic "wait for the prey" technique, the Reddish Egret is an active forager -- employing all of the techniques of the Tricolored plus Canopy Feeding. 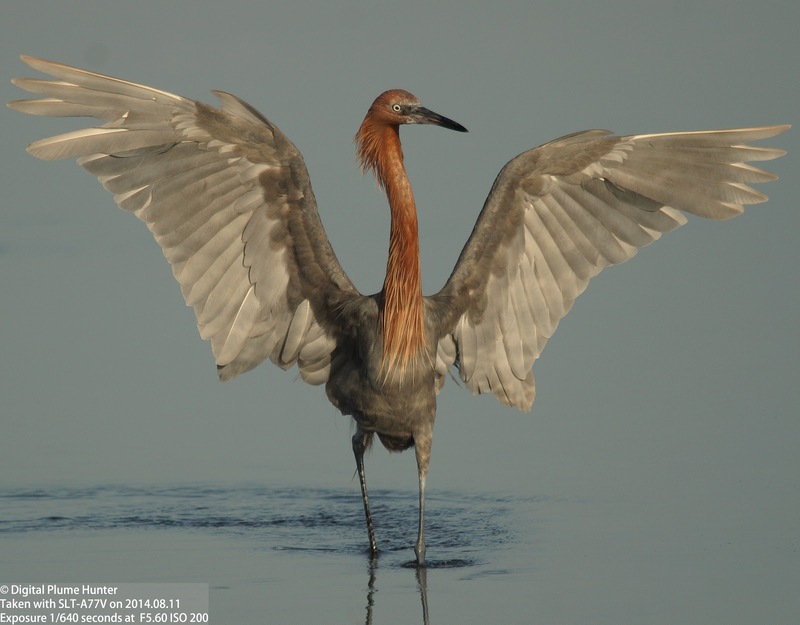 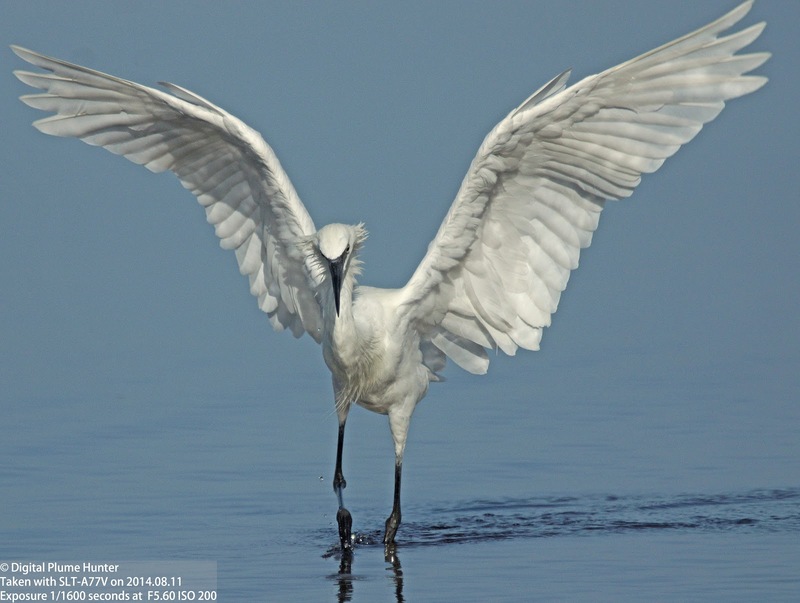 The white morph of the Reddish Egret displays exactly the same behaviors. 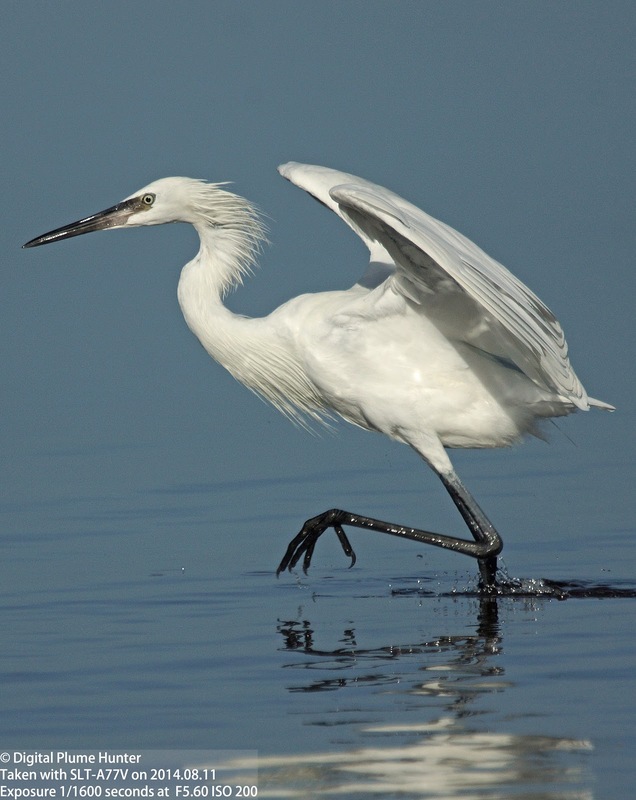 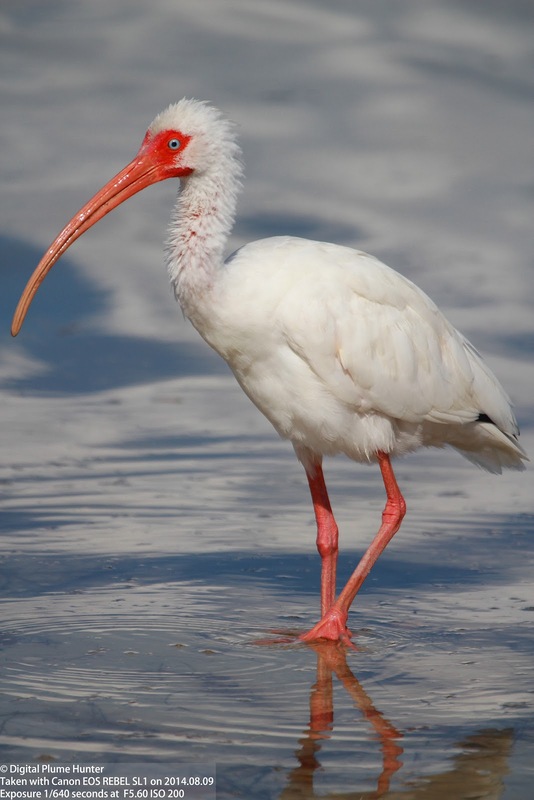 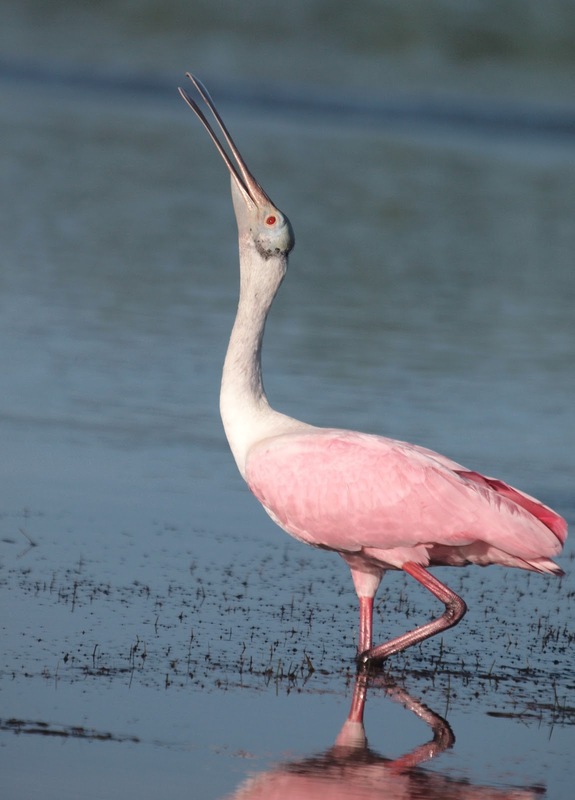 It is a little known fact that the occurrence of the white morph varies by geography -- from a low of 5% for Reddish Egrets found on the Texas coast to a high of 90% for those on Great Inagua in the Bahamas. 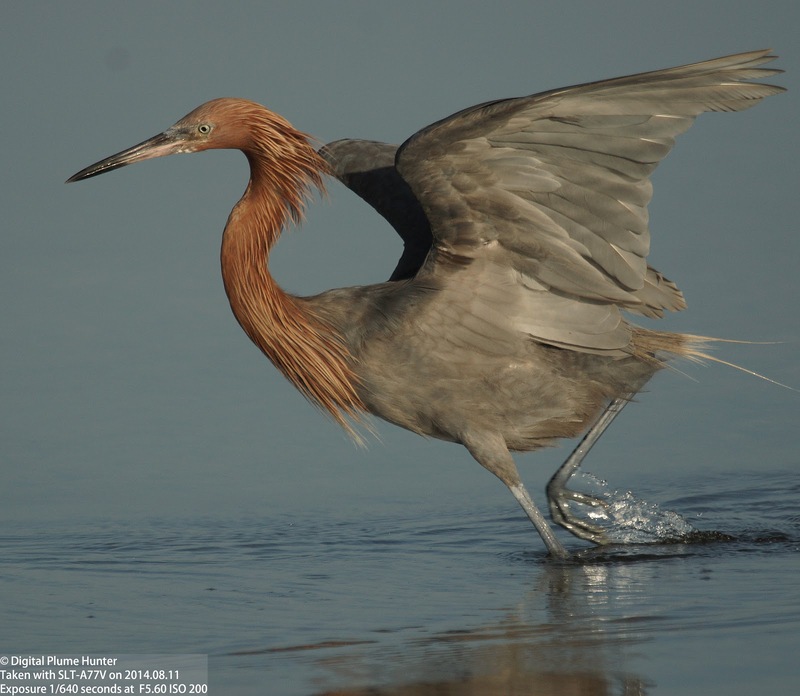 About 15% of the Reddish Egrets in Florida are white morphs (incidentally, compare this to less than 1% for the occurrence of Great White Herons among Great Blues). 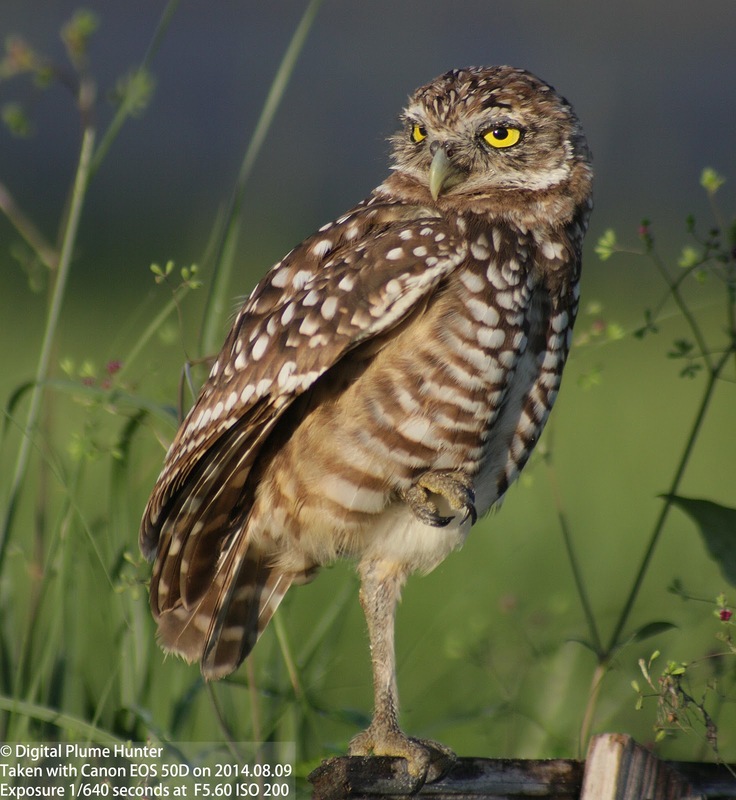 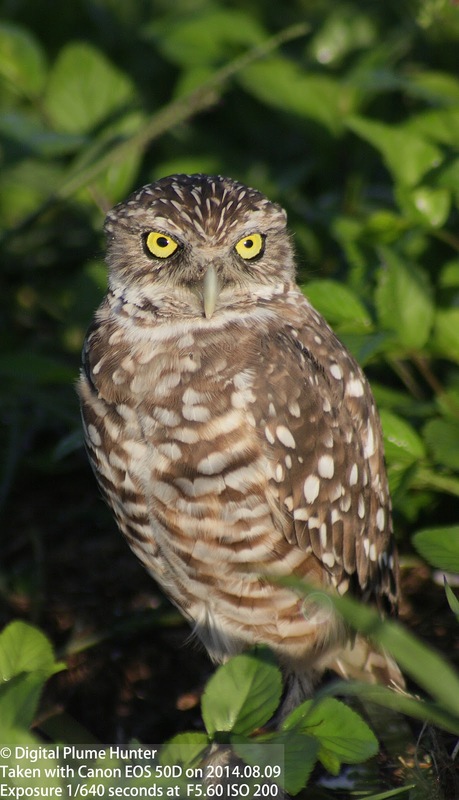 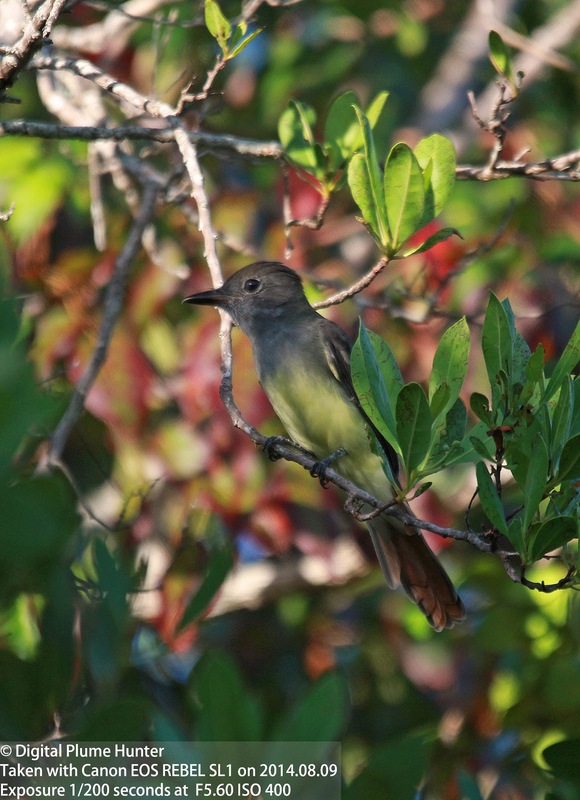 The scientific study of our avifauna sheds tremendous insights into the world of birding; and, as a consequence, the pursuit of birds whether as a sport, recreational obsession, or photographic quest is greatly enriched when supplemented by Ornithological accounts that are now more accessible than ever to the birding enthusiast. 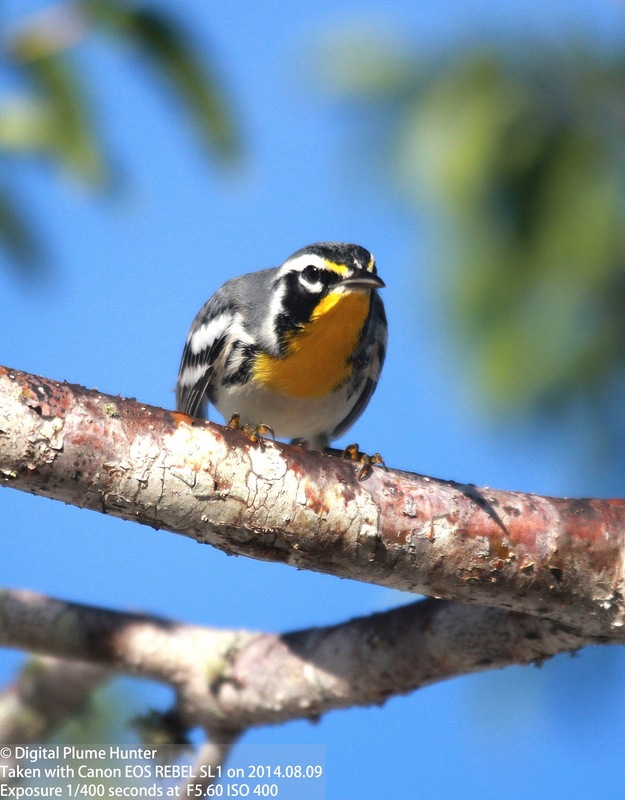 A recent excursion to Corkscrew Swamp had provided some encouraging warbler sightings (Black-and-white Warbler, Northern Parula, Northern Waterthrush) and this trend received further impetus with the sighting of an early arrival from the North: the Yellow-throated Warbler at Tigertail Beach on Marco Island. 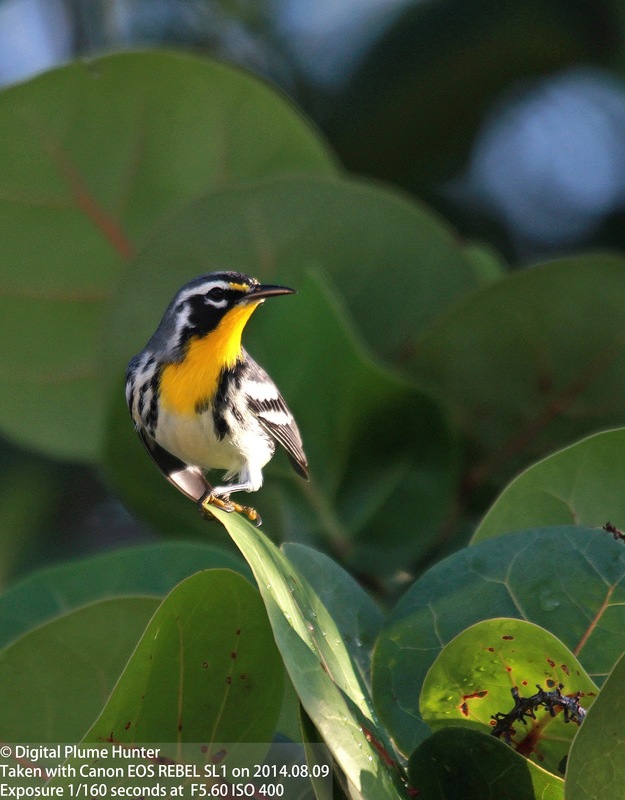 Southwest Florida is not known to be a breeding hotspot for warblers compared to our Northern States that can boast up to 20 species. 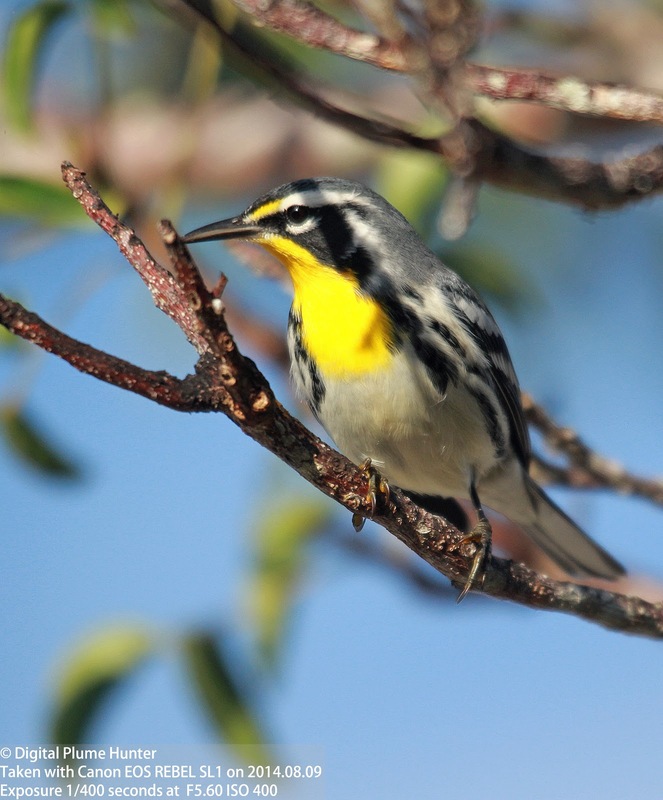 SW Florida, by comparison, has just a few -- Northern Parula, Common Yellowthroat, Yellow, Pine and Prairie warblers (an excellent resource for which is the Florida Breeding Atlas); however, come Fall and Winter, the tables are turned as warblers flee their increasingly frigid Northern homes and SW Florida becomes a mecca for wintering warblers -- including Yellow-throated Warbler. 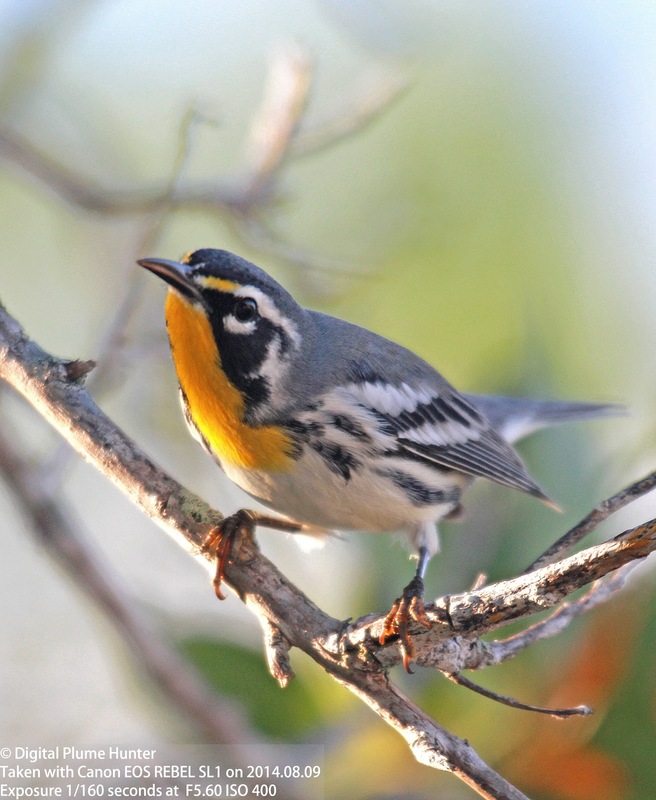 While Yellow-throated Warbler is commonly seen as an over-wintering warbler here, August marks the earliest month that this blogger has witnessed it in these parts. 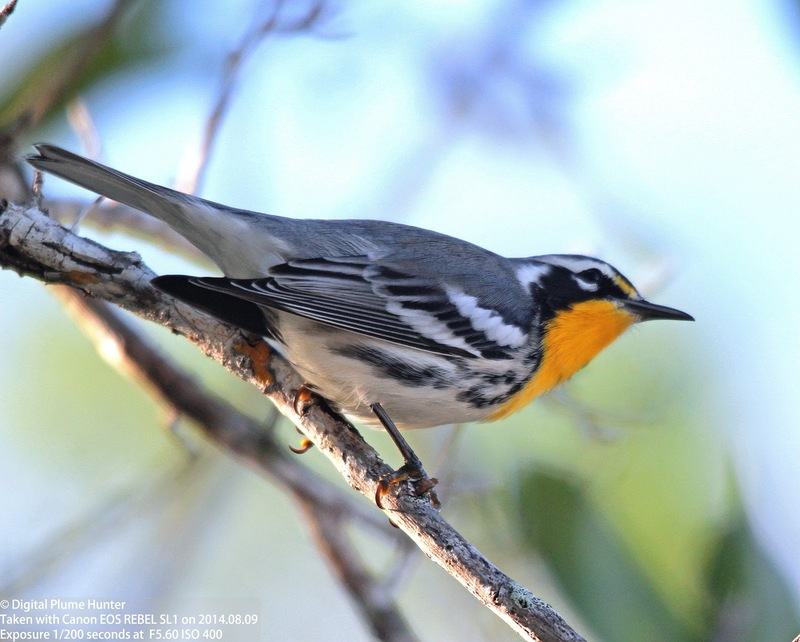 The warbler itself is unmistakable with its white undersides, yellow throat, bold facial markings and grey upperparts all lending a clean, crisp look to this Southeastern Warbler. 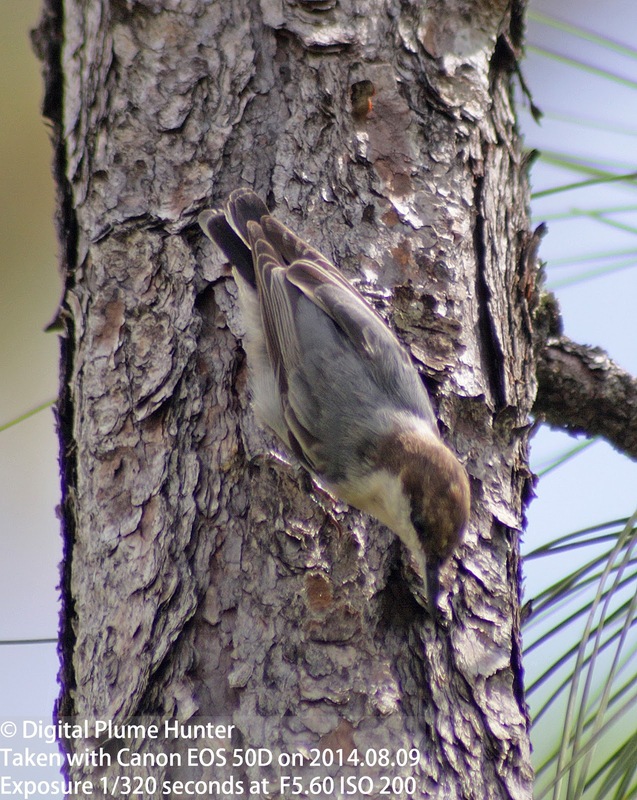 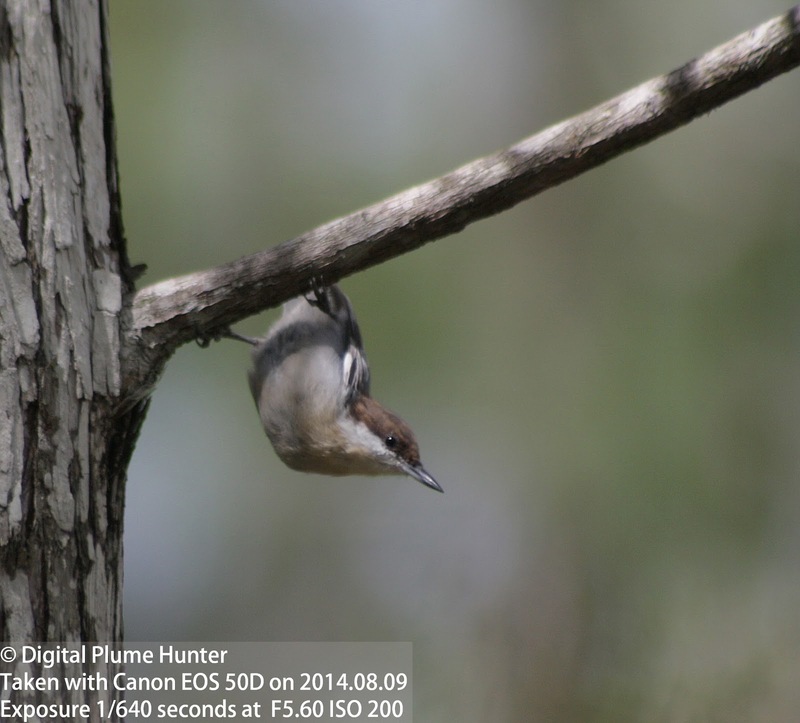 This is our (as in SW Florida's) only species of nuthatch with neither White-breasted nor Red-breasted Nuthatch ranging this far South. 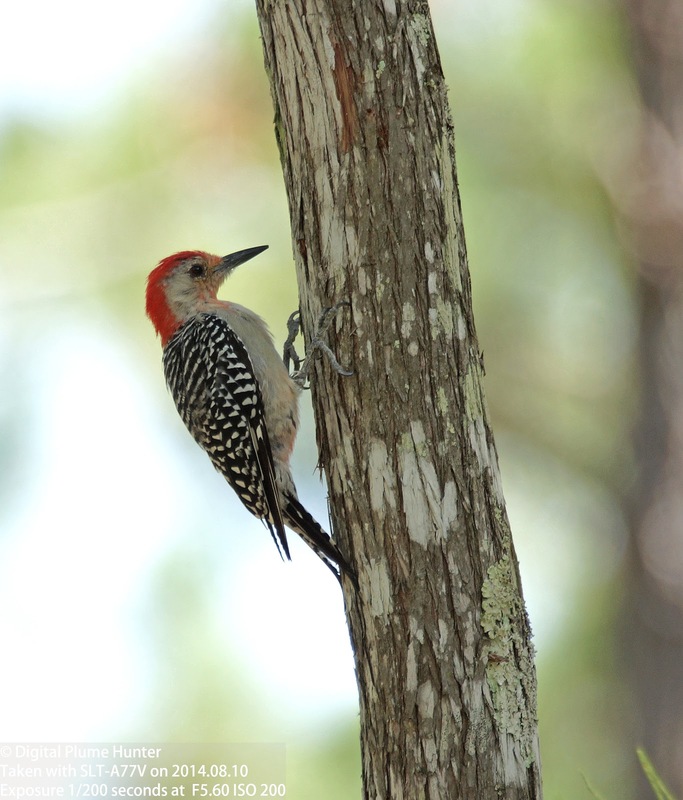 Also seen in the vicinity were Downy and Red-bellied Woodpeckers. 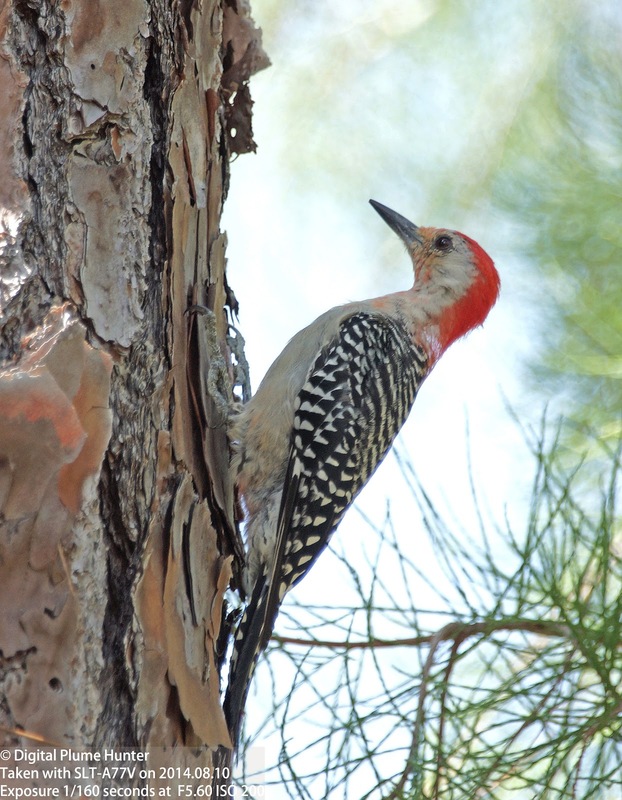 While any sighting of the Red-bellied Woodpeckers is unlikely to take the Birding listservers by storm, still, it is, nonetheless, a striking woodpecker with a bright red head and strongly barred back -- a description that surely beggars the accuracy of its moniker. 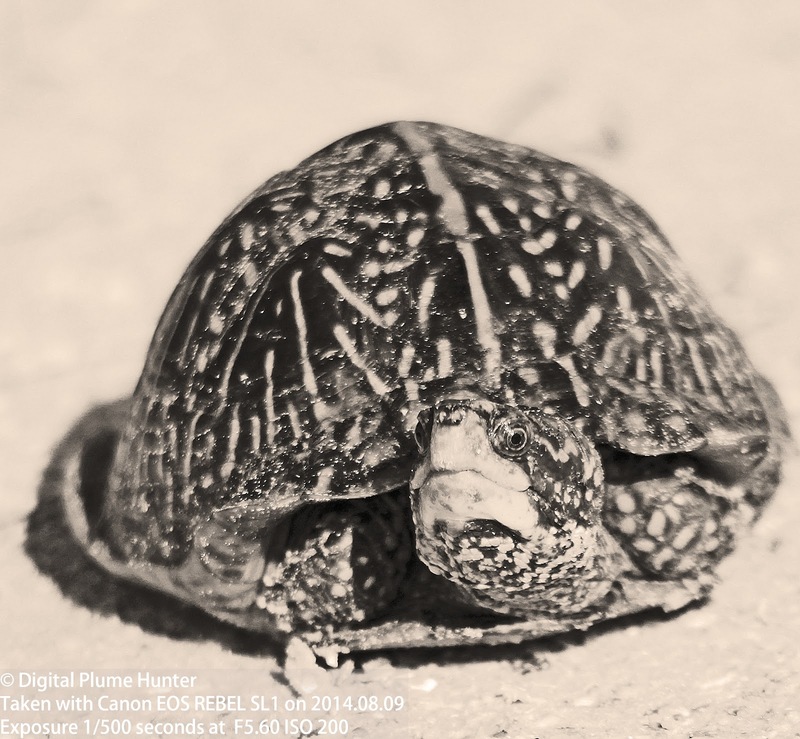 Diversity, it is said, is the spice of life and perhaps nowhere does this adage hold truer than in the digital pursuit of plumes.